..So for T'ai Chi, centring, awareness, self-remembering, are the right words to understand. .. When doing these exercises, feel more like a liquid, Flowing energy, than like a solid body. Drop the concept of a solid body and help to focus on a different concept of liquid, fluid, flowing energy. 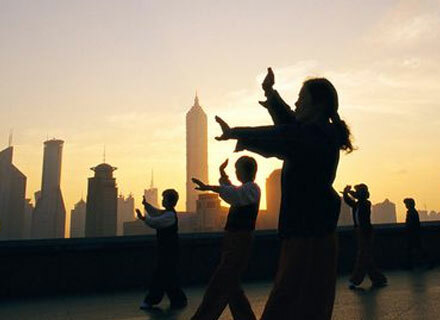 Before you start Tai Chi start doing this in the night so that you will be ready. Before going to sleep, just sit in the bed and start feeling that you are energy, and that energy is flowing all around your body. You are in a whirlpool of energy -- ripples, waves, are coming. Then feel that the whole room is full of energy, and it is your energy. You don't know where to make a demarcation; you don't know where you stop and the world starts. Then feel that the energy is flowing and becoming bigger and bigger like a balloon. Not only is it in the room, the room is in it, the whole house is in it. You have become a flood. At this moment, go to sleep. This will take not more than three to five minutes. While you are falling asleep, continue to feel like a flood -- surging waves reaching to the high heavens and the whole world is engulfed in you, in your energy. Just fall asleep meditating on it so it will enter into your sleep and will remain there as a shadow, hovering around you the whole night. In the morning, the moment you feel that you are awake now, don't open your eyes -- first feel again the flood-like energy. Connect yourself again with the time you fell asleep. Bridge it again. Again start feeling like a surging wave, an ocean, an oceanic energy. Just for three to five minutes Lying in the bed, and then get up. You will feel very very energized and vital. You will feel a new elan rising in you, a new life. Continue this for a few days and then go into TaiChi. Then you will be perfectly ready. Chi means energy. The whole concept is that solidity is false -- just as in modern physics. These walls are not real -- it is just pure energy, but the electrons are moving so fast, with such terrific speed; that's why it appears solid. Just like a fan can move with such a terrific speed that you cannot see the blades separately. So it gives a sense of solidarity. The same is true with your body. What modern physics has come to know right now, Taoists have known for thousands of years -- that man is energy. It is said about a Tai Chi master that he would tell his disciples to attack him, and he would just sit in the middle. Five or ten disciples would rush from every corner of the room to attack him, but when they came near him, they would feel as if he were a cloud; there was nothing solid... as if you could pass through him and you would not be obstructed by anything. If you continue this idea that you are energy, it is possible to become just like a cloud with no boundaries, melting and merging with existence. This anecdote is not just an anecdote. With a man who has gone deep into T'ai Chi, it is very easily possible that when you come across him, you will not find any obstruction; you can simply go through him. You cannot hurt him because he is not there to be hurt. So for these ten days before you start Tai Chi, imbibe the spirit."